The Countryman is Mini's fourth model as well as its first four-door car. With the CT 200h compact hybrid hatchback that debuts at the Geneva auto show, Lexus is responding to a growing demand for smaller, more fuel-efficient cars, especially among young city dwellers just as rival Audi is with the A1. Mercedes-Benz will debut the F800 Style concept, which showcases the future styling direction for the German brand and a new rear-drive vehicle platform engineered for both plug-in hybrids and fuel cell cars. 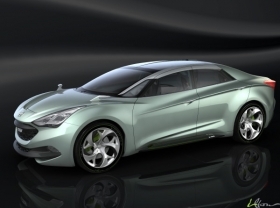 Hyundai will unveil a concept car previewing a mid-sized sedan that will rival models such as the Opel/Vauxhall Insignia and Ford Mondeo in Europe when it launches next year. Kia, Mini and Mazda also have key debuts in Geneva. Below is the third part of Automotive News Europe's A-Z guide to Geneva launches covering automakers from Hyundai to Mini. Hyundai will unveil a concept car previewing a mid-sized sedan that will rival models such as the Opel/Vauxhall Insignia and Ford Mondeo in Europe when it launches next year. The concept was styled at the company's European design headquarters in Ruesselsheim, Germany. The i-flow showcases new technologies from chemical company BASF to reduce weight and improve fuel economy including lightweight materials and solar cells. 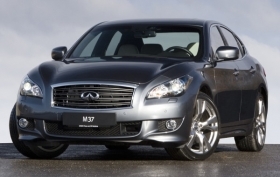 Infiniti will give a European debut to its M Line of performance sedans, which will offer the luxury brand's first diesel engine, which has been designed specially for Europe. The M Line sedans will go on sale in western Europe starting in September with a 3.0-liter V6 diesel or 3.7-liter gasoline V6 with a gasoline-electric hybrid to follow in 2011. Kia will unveil the third-generation of its Sportage SUV, which moves away from the rugged off-roader look of the first Sportage, launched in 1993, to sleeker crossover proportions. The new Sportage is longer, lower and wider than the first- and second-generation models and has a more dynamic exterior look, as well as more interior space for people and cargo. The redesigned Sportage will go on sale in the United States this summer and in Europe in September. 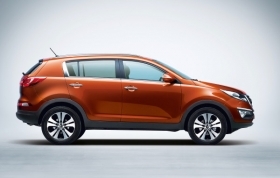 Kia will build the new Sportage for Europe at its plant in Zilina, Slovakia. The crossover will be produced alongside its ix35 sister model from parent company Hyundai Motor Co.
Lamborghini will unveil a new Superleggera variant of its Gallardo 5.2-liter V-10 supercar with horsepower increased to 570 hp. Superleggera means ultra lightened in Italian. In 2007, Lamborghini introduced a limited-edition Gallardo 5.0-liter V-10 Superleggera that was 7 percent lighter than the standard model. Lexus says its CT 200h, the first full hybrid vehicle to be launched in the premium compact segment will go into production in late 2010. The model was designed and developed with the European market in mind but will be sold worldwide. The hybrid drivetrain in the CT 200h combines a 1.8-liter gasoline engine with a electric motor. The car can run on electric power for up to 1.2 miles (nearly 2 km) at speeds up to 28 mph (45 kph). With the CT 200h, Toyota's luxury brand is responding to a growing demand for smaller, more fuel-efficient cars, especially among young city dwellers. The CT 200h “will provide a new gateway to the Lexus range and attract new, younger customers to the brand,” the company said in a statement. The model is Lexus's first five-door compact car. The production CT 200h retains strong visual links to the LF-Ch concept Lexus unveiled at the 2009 Frankfurt auto show. Lexus says the CT 200h's styling is an evolution of the brand's L-finesse design philosophy with a distinctive, sharp-edged look that, Lexus says, sets it apart from its premium compact rivals. The new Mazda5 that debuts in Geneva will be more fuel-efficient than the current model and is the first production vehicle to adopt Mazda's Nagare design philosophy. A set of wavy ridges on each side of the compact minivan is part of the brand's Nagare design philosophy. Nagare means flow in Japanese. The Mazda5 lowers carbon dioxide emissions by 15 percent with a 2.0-liter gasoline direct-injection engine combined with Mazda's "i-stop" start-stop technology. European customers will also be offered a 1.8-liter inline-four engine. U.S. powertrains have not been announced and Mazda hasn't decided whether start-stop will be used in the U.S. version. The current U.S. edition has a 2.3-liter powerplant. Functional interior ideas include multiple seat arrangements and a second-row center seat that can be converted into storage space. 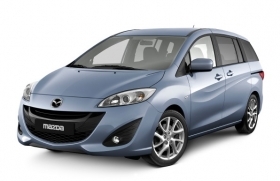 The new Mazda5 is scheduled to go on sale in Europe this autumn with a U.S. launch early next year. Mercedes-Benz will debut the F800 Style, a sleek-looking sedan concept with minivan-like doors that unveils the future styling direction for the German brand. The concept also showcases the automaker's new rear-drive vehicle platform, engineered for both plug-in hybrids and electric-drive models powered by fuel cells. The concept's silhouette has short overhangs, a long wheelbase and a flowing, coupe-like roofline. The overall vehicle length is similar to the current generation E-class sedan. Huge intake ports at the front corners of the vehicle surround a new interpretation of the Mercedes grille area. On the side, sculptured side body panels help create a sense of motion. Rather than a conventional four-door sedan, the concept's rear doors pivot and slide toward the back of the vehicle. Mercedes says the advantage is easier ingress/egress in tight parking spaces. Mini's new Countryman SUV is a more ruggedly styled addition to the BMW-owned British brand's lineup. The new car offers optional all-wheel drive. Expanding Mini's lineup is part of BMW's bid to boost the brand's profitability. The Countryman is Mini's fourth model as well as its first four-door car. The Countryman will be offered with three gasoline and two diesel engines. In Europe it will have technologies such as brake regeneration and engine stop-start to reduce fuel consumption. BMW has not said whether the U.S. will get these technologies. 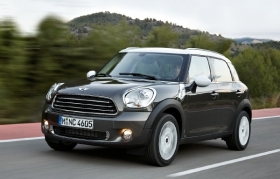 The Countryman will go on sale in Europe in September with prices starting at 20,200 euros in Germany. U.S. sales begin in early 2011.